Top 5: Why purchase second-hand equipment - Les équipements Procepack Inc. When you purchase packaging equipment, you get several options. Purchasing machines is a big deal for a business, no matter the sector you’re in. Buyers can go for new or second-hand equipment. We listed below the perks of purchasing second-hand equipment. Second-hand equipment costs a fraction of new ones, although you have to be very careful with what machine you buy. Several manufacturers and second-hand dealers have proven their worth, so just make sure to properly identify them. For example, Procepack only sells high-quality inspected equipment. New equipment is more and more modern and complex, with advanced electronic components. Training your employees on how to use these machines can be expensive, and sometimes training just isn’t available. Hiring new already-trained employees can be even more expensive. Purchasing second-hand equipment often means purchasing more efficiently. This perk is very similar to the low costs advantage, except that it focuses on the cost difference depending on the quality. A second-hand product that costs as much as a new one would naturally be of better quality, although you do need to check the equipment wear and tear. Second-hand machines are also often made by proven manufacturers. When your boss hands you a project assignment, chances are deadline was yesterday. Unfortunately, terms of delivery for new equipment may be exceeding 9 months due to manufacturing time. With second-hand dealers, waiting periods are significantly lower given that the equipment has already been manufactured and it may only need reconditioning. 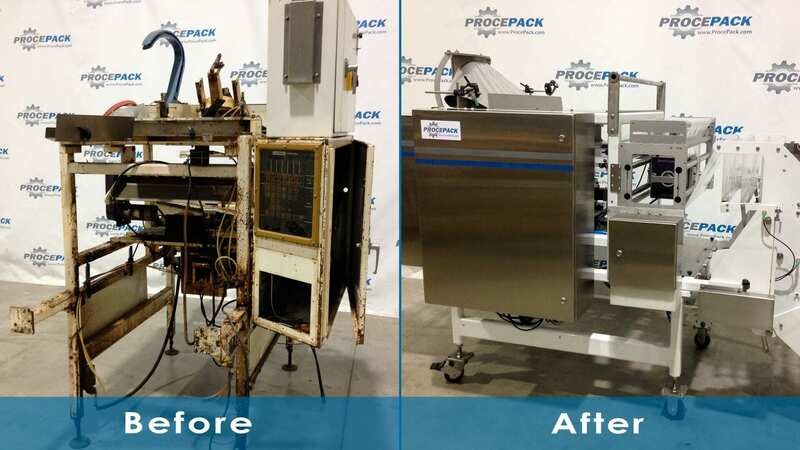 To speed up the process, deal with a company like Procepack that keeps a large equipment inventory. When purchasing new equipment, you deal with a company that only wants to sell its products, with little or no focus on your needs. In a company like Procepack, we maintain no close ties with one specific manufacturer, which means we always sell the equipment best suited to your reality, no matter the manufacturer. Purchasing used equipment also has its perks: it enables you to buy the entire line in one place, while purchasing new equipment complete line implies having to deal with several manufacturers for every section: labelers, cappers, fillers, and so on. With a company like Procepack, you can get all your equipment at the same location. We recondition your selected machines so they all work efficiently together, we perform all acceptance tests (FAT) in one place, and we deliver and install your equipment all at once. You should nevertheless be aware that there are still some risks when purchasing second-hand equipment, such as the machine’s origin, associated reconditioning costs and hidden defects. However, when a company knows its equipment, it also knows where it comes from and so can guide you on the reconditioning costs at a glance and quickly identify any hidden defects. That is why Procepack recommends purchasing your equipment from a second-hand dealer rather than dealing directly with another manufacturing plant. Choose a company that has extensive experience in selling second-hand equipment with a wide part inventory to support maintenance, where needed.